Heat the olive oil in a frying pan and add the chopped onion, green pepper, red chilli (if used) and garlic clove to the pan. Stir fry together for 6 minutes. Mix in the beans and baby tomatoes and heat together for another 5 minutes. In the meantime - Make the toast and fry the eggs in a separate pan. 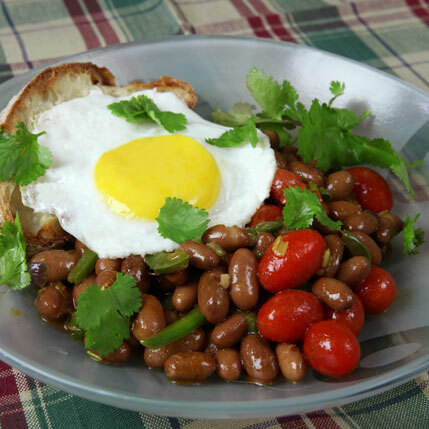 Serve the fried eggs on a bed of the bean mixture together with a slice of toast and a generous sprinkling of coriander leaves.